We had to get up bright and early at 6:20 am on Monday morning to drive up to LAX so Tom could catch his plane back to Columbus. After I dropped him off at the airport I headed over to a hotel near the USC campus where I was staying for the next two nights. I was scheduled to give a seminar at USC on Tuesday, which was the official reason for the trip. I spent much of the day working on my lecture and answering e-mail. The beer scene in Los Angeles is much more disperse and less developed that San Diego, but it seemed like a waste not to check out a few things while I was there. Our accomplice from Saturday night, LA Beer Girl, had told me that I really should check out The Bruery if I had the opportunity, so about 6 pm I got in my car and navigated through the LA traffic down to Orange County to visit the Bruery. 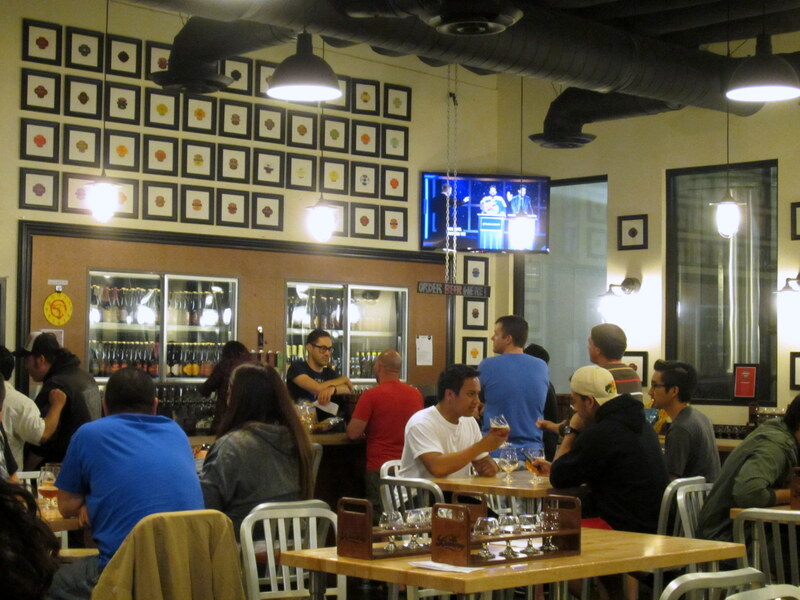 Like many of its San Diego brethren, The Bruery is located in a commercial/industrial park area. On the inside there is a pretty decent sized, well lit bar a little larger than Alesmith. The night I visited there were 32 beers on tap, plus 2 beers that were only for reserve society members. They sell fights that come in sets of five 2 ounce tasters. The process is the most organized of anyplace I visited, probably because of the multitude of beers to choose from. You pick up an 8.5” × 11” sheet of paper with descriptions of the beers, along with long but narrow sheet of paper that is a menu of all the beers on tap for the night (see photo below). After you’ve decided which beers you’re going to try you check them off on the menu. After I had made my choices I got in line to turn in my sheet to the bartender who filled my order. Even though it was a Monday night the place was pretty busy. Just as I got my flight a seat opened up at the bar, so I grabbed it and sat down to start my tasting. A couple sat down next to me and I started a conversation with them because the woman, Selina, who was in town from Portland was wearing a Crux Fermentation Project shirt. I’ve heard a lot of good things about that place from my friends Michelle and Andy, so it was an easy conversation starter. We ended up talking for most of the night and I was grateful for the company. It allowed me to stretch two tasting flights out over two hours, which was good because I had to drive back to downtown LA, and unlike George Thorogood given the choice I’d prefer not to drink alone. 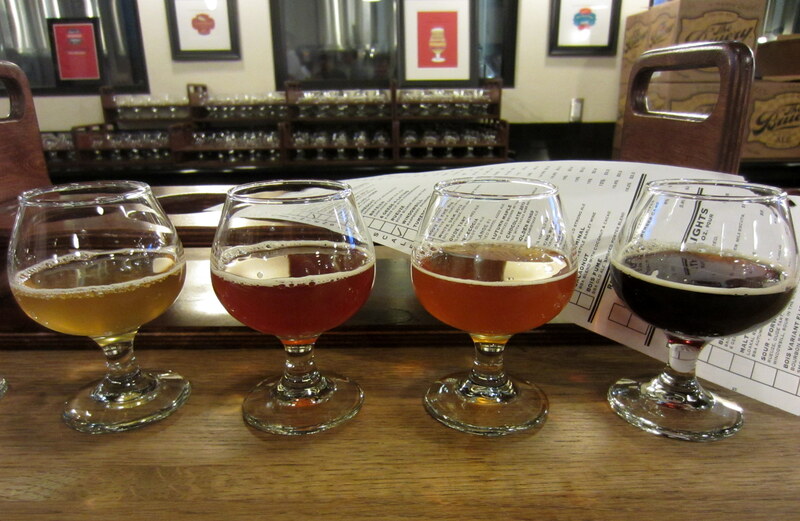 The Bruery is known for Belgian-style and barrel aged beers. As a point of principle they don’t make an IPA. Bruery beers are available in Columbus and I’ve tried several of them (Mischief, Saison Rue, Saison de Lente, Tradewinds, Hottenroth). I’ve never been disappointed with a Bruery beer, but I don’t drink them all that often because they only come in 25 oz bottles with price tags that range from $9-$25. In other words it’s a little expensive to sample their catalog. At the tasting room more than half of the 2 oz pours were $1 per glass, with some of the stronger barrel aged beers going for prices up to $3.5 per taster. I realize that on a per ounce basis this is not much of a bargain, but if you want to sample a variety of their beers this is an ideal setup. By the end of the night I was able to sample 10 Bruery beers for $18, which is less than the price of one bottle of Sour in the Rye or Oude Tarte. 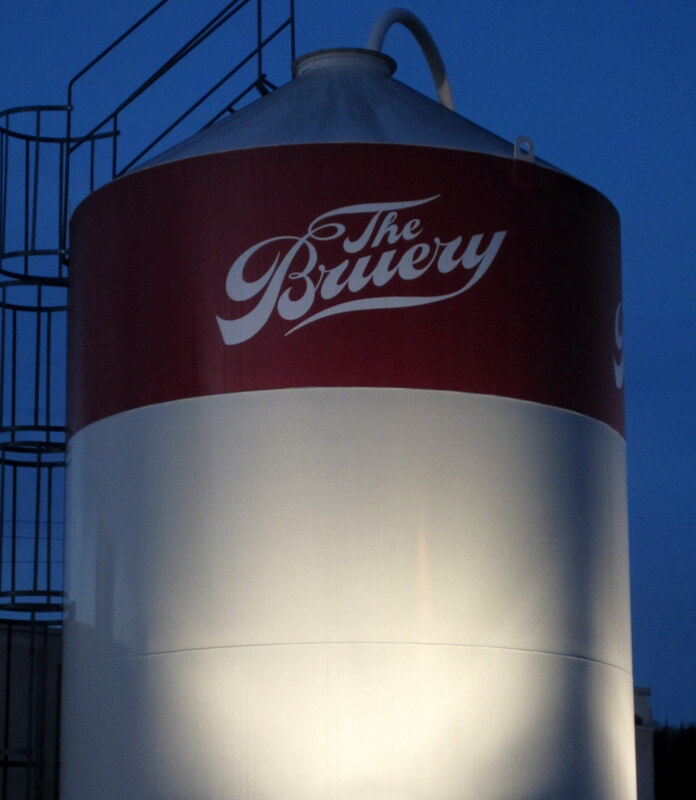 Here are a couple of things to keep in mind if you visit The Bruery. They have a few snacks but they don’t serve food, nor are there any food trucks in the vicinity (at least not on a Monday night). Many of their beers are strong, nearly half on the list have an abv over 10%, and on the night I visited nine beers had an abv over 12% and therefore would not be legal for sale in Ohio. So you either have to show some self-restraint in what you drink or you need to plan a way to get home without driving. Unless you have a designated driver the latter is not such an easy feat in the sprawl of Los Angeles and Orange counties. Despite that complication it is definitely worth the trip. If I rate on the quality and uniqueness of the beer The Bruery was hands down the best place I visited on the four day trip. 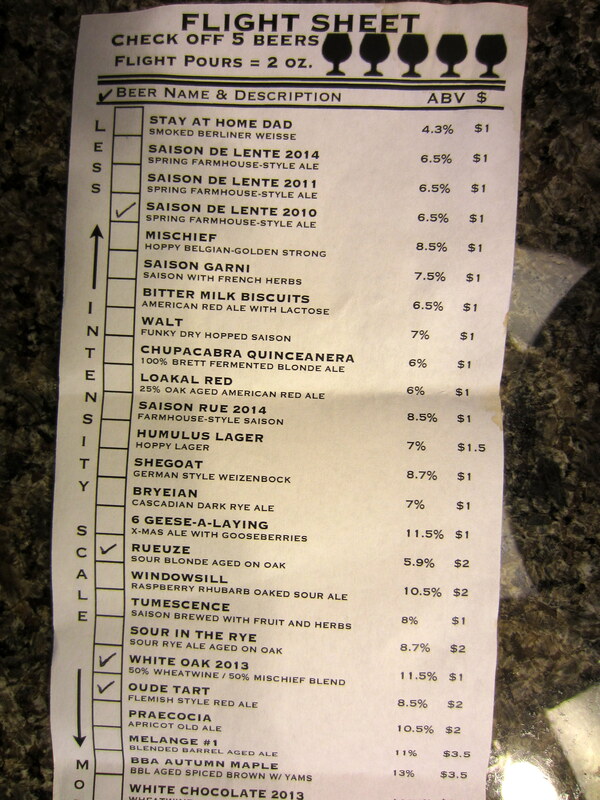 Saison de Lente (6.5% abv) – They had three different vintages on tap (2010, 2011 and 2014) I sampled each of the older two. I’ve had this beer before out of the bottle and it did not make much of an impression on me, but I have to say this beer at the brewery was very good. Dry with peppery notes, some restrained Brett funk, and surprisingly a bit of vanilla. I’m going to have to try this again out of the bottle. Chupacabra Quinceanera (6% abv) – This was a tasting room only release. Described as a 100% Brett fermented blonde ale, it was dry, easy drinking beer with a healthy dose of Brett funkiness. Sour in the Rye (8.7% abv) – An American wild ale made with a healthy dose of rye in the malt bill and barrel aged for over a year. This beer has a nose reminiscent of cider, like most sours, but a very complex taste. It’s definitely tart, but at the same time there is black pepper, cloves, some fruit in the background, and a bit of vanilla at the finish. You can get this in Columbus and after this taste I’m going to have to break down and a get a bottle. Rueuze (5.9% abv) – The Bruery’s take on a Belgian Gueuze, blending different barrel aged sour blond ales. It was a sour beer as expected for a Gueuze, but not necessarily better (nor cheaper) than the real thing you can buy from Belgium (like Boon). Oude Tart (8.5% abv) – This beer is made in the style of Flanders Red Ale, aged in red wine barrels for 18 months. Among those I tried this was the sourest beer of the night. As I recall it did not have the same level of acetic acid/malt vinegar taste that you get in a Rodenbach. Windowsill (10.5% abv) – This beer is described on the tasting sheet as a raspberry, rhubarb oaked sour ale. I’m a big fan of rhubarb so I had to give this one a try. The nose is sweet and fruity, no hint of the tartness that accompanies the taste. This beer is tart enough to keep it from being too sweet, but not enough to make you pucker, in other words not quite as tart as rhubarb itself. The malts add some bready flavors that give it a flavor reminiscent of a rhubarb-raspberry pie. The 10.5% abv is very well hidden. Unfortunately this is another tasting room only release. Melange #1 (11%) – A blended beer containing a mixture of Black Tuesday (a bourbon barrel aged Stout) and Oude Tart. This is a rich malty beer, lots of caramel from the barrel aging. The mixture reminded me of a barrel aged scotch ale. White Oak 2013 (11.5% abv) – This is a blend of two beers in equal proportions—Mischief, which is the Bruery’s Belgian strong golden ale (in the style of Duvel) and a wheat-wine aged in Bourbon barrels. What a fantastic combination, the barrel-aged wheat-wine gives rich caramel and vanilla flavors while the Mischief adds a healthy dose of hoppiness that balances the sweet maltiness of the wheat wine. This is a must try for me when I get back to Columbus. Cacaonut (15.6% abv) – This beer is a blend of different barrel aged beers (identities not disclosed) along with roasted coconut and cacao nibs. It smells very similar to a chocolate dipped coconut macaroon and tastes deliciously decadent. It’s hard to believe it packs a 15.6% abv. This was an incredible finish to my evening’s tasting. If you liked this check out the posts on the other three days of my trip.